"Here I am at Chagford in a beautiful old mullioned and gabled perpendicular inn - granite and syenite everywhere - my windows looking out on the old churchyard, and beyond, a wilderness of lovely hills and woods -two miles from the moor - fresh air and health everywhere." So wrote Charles Kingsley, author of The Water Babies, in a letter to his wife of September 1849. Indeed, there is little doubt that he would instantly recognise it today, little changed as it is from the time he spent three days as a guest. Some estimate that it may date from as far back as the 13th century, although it should be noted that the English Heritage listing text describes it as "probably late C16" in the main, with 18th and 19th century rear blocks, and some 20th century modernisations. But, whatever the truth, the Three Crowns is undeniably a stunning building entirely worthy of its Grade II* status. 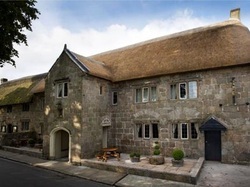 The inn is also noted for being where Sydney Godolphin, poet and politician, died in February 1643 during a gunfight between Royalist forces and parliamentarian soldiers who were staying in the building. It is said that the porch is the exact spot where he passed away, and some of those who believe in such things reckon his ghost still roams the place. With 21 rooms in all, including the Sydney Godolphin Suite above the aforementioned porch, the Three Crowns offers some extremely highly rated hospitality and a perfect location from which to discover the delights of Dartmoor National Park.